A 27-year-old suspected murderer, Amadi, said he was arrested recently by policemen in Port Harcourt because of his dressing. 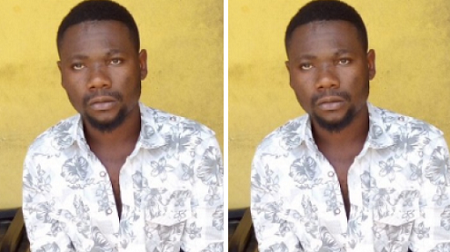 Amadi has been at large since December 19, 2016 when he allegedly stabbed somebody to death at Aker Base waterfront in Rumuolumeni, Obio/Akpor Local Government Area of Port Harcourt, Rivers State. The suspect told Daily Sun yesterday that he was apprehended on Monday, August 21, 2017 along Nkpordiagha road by policemen from Rumuolumeni Divisional Police Station overseen by Mr. Kingsley Chukwueggu. He admitted to have committed the act as a retaliation during a fight with some boys who stabbed him and his companion. Amadi said that he fled home after the incident in December 2016 and was nabbed recently when he boarded a tricycle from Nkpordiagha to waterfront to enter Port Harcourt City. He recalled the incident that led to the death of the boy was refusal of people carrying out oil bunkering at Aker Base waterfront to pay their daily fee to the community. Amadi said he is an unemployed welder and was among the youths appointed by his community to collect money from the people doing bunkering business at the waterfront. He explained: “When we got there (waterfront), we asked the boys doing business there the owner of the product. The boys did not respond. We asked them again but none of them answered us.